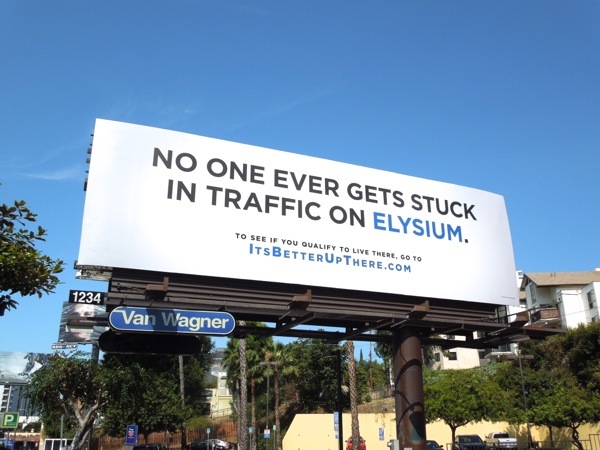 In honour of the fact that San Diego Comic-Con is happening right now and all this weekend, Daily Billboard thought that we all needed something decidedly sci-fi to celebrate the infamous geekfest. 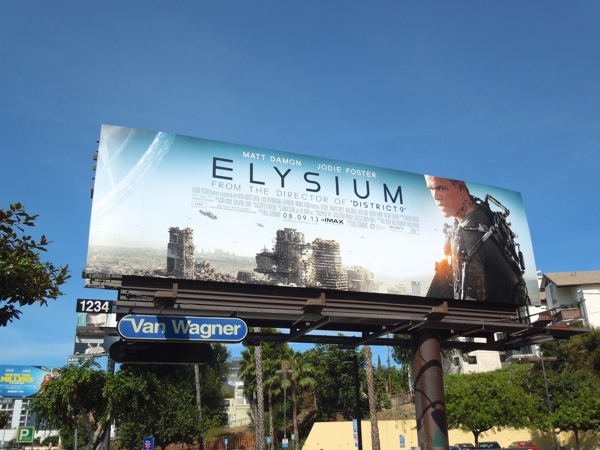 What better than Neill Blomkamp's follow up to 2009's highly-acclaimed District 9, his new futuristic vision, Elysium. 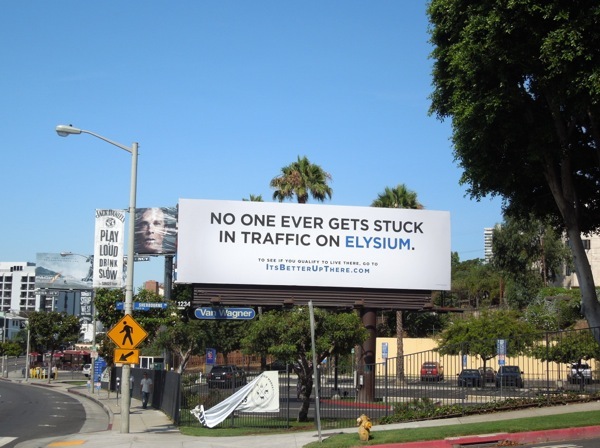 And in the same way that they teased that fantastic alien refugee camp thriller, Elysium also received the viral advertising treatment with these 'No one ever gets stuck in traffic on Elysium/It's better up there' billboards. 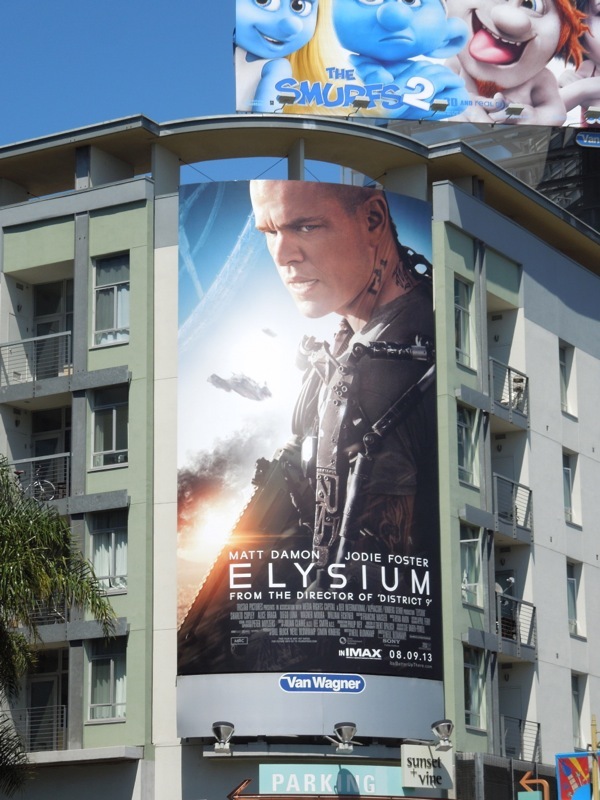 Set in the year 2154, the wealthy live on a pristine man-made space station called 'Elysium', whilst the rest of humanity struggles to survive on an over-populated, ravaged Earth. 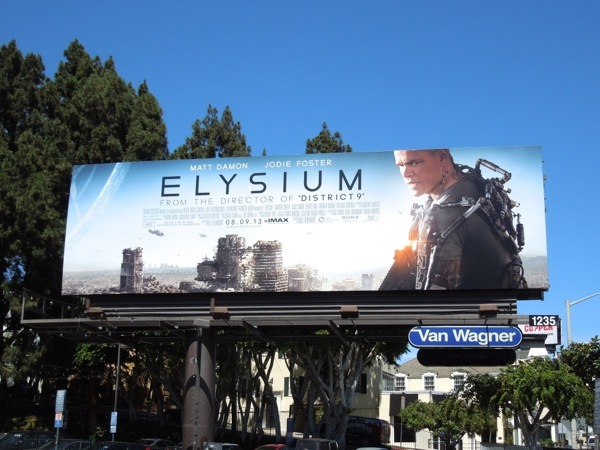 Jodie Foster stars as a government official determined to protect Elysium's tough anti-immigration policies and preserve this luxurious orbiting sanctuary's privileged way of life, whilst the earthbound Matt Damon risks his life on a dangerous mission that may bring equality to the polarized class system. 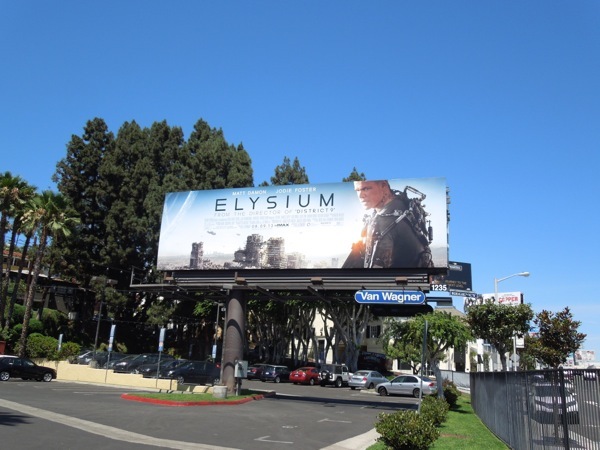 Daily Billboard really appreciates Blomkamp's fresh take on science fiction writing and directing, and the original aesthetic quality he brings to his futuristic worlds, so we hope this movie proves to be as epic and as Oscar nomination worthy as the last one. 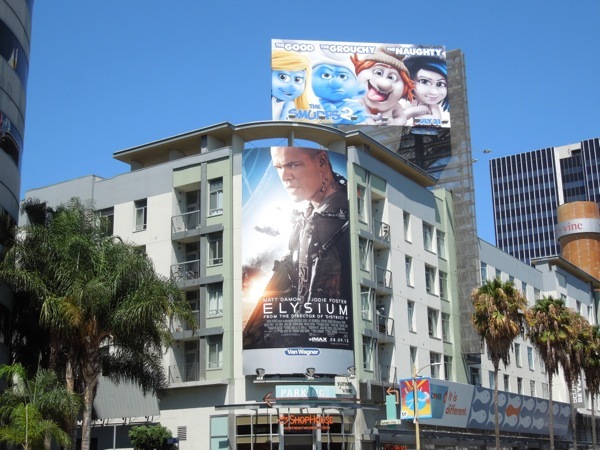 The teaser billboard was first spied along the busy Sunset Boulevard at Sherbourne Drive on June 28, whilst the movie's official ad creative featuring a teched-up Matt Damon, was snapped on both sides of the same ad hoarding on July 16, 2013. 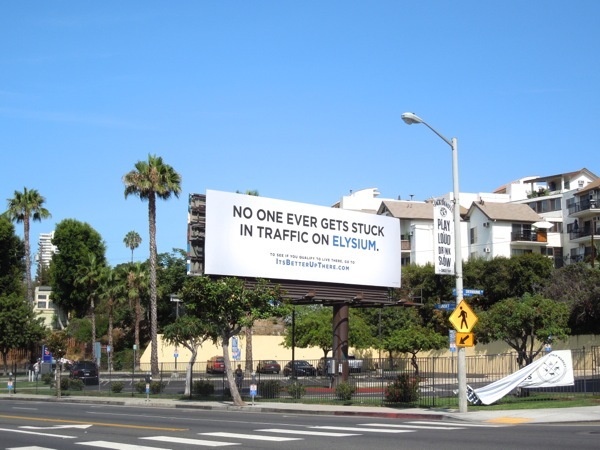 If you like this ad campaign, be sure to also check out the billboards for District 9 from around the streets of L.A. in 2009. 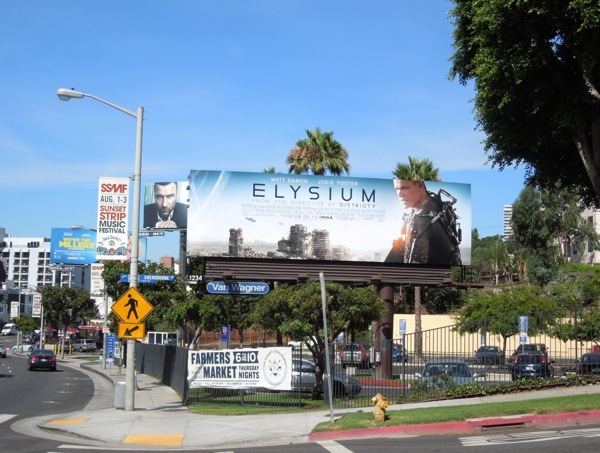 UPDATED: Here's a vertical format billboard for Elysium, showing more of Matt Damon's futuristic high-tech suit, which was spied at Sunset & Vine in Hollywood opposite the Cinerama Dome on July 29, 2013.